I always swoon over photos of negimaki. 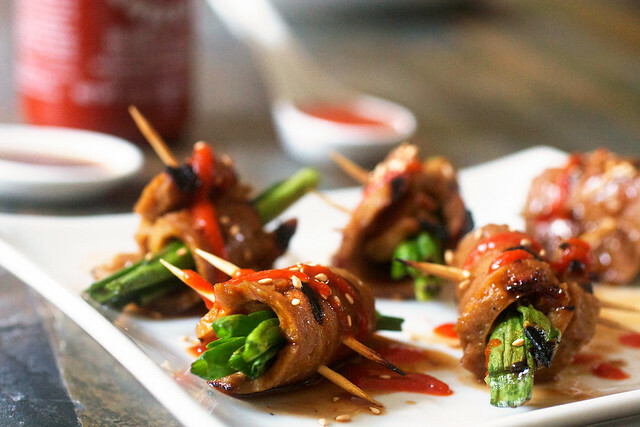 Beautifully grilled teriyaki rolls stuffed with vibrant scallions. See? Did you swoon? A vegan version is easy enough. The meat = seitan and the scallions = well, those are already vegan, silly! I tried to keep the ingredients list as simple as possible. The characteristics that I wanted to really shine were the charred grilled flavor and, of course, the scallions. The simple marinade of hoison and mirin really does its job, keeping things juicy with the perfect marriage of sweet and savory. Don’t feel like you can’t serve these unless you’re having an all-out Japanese feast. If you’re hosting a little garden soiree (or just watching TV, or catering a bar mitvah…) you can serve these rolls right along hummus and stuffed mushrooms. I guess I take a fairly laid-back approach to menu planning; it’s more about the balance of the overall menu rather than following a strict flavor profile outlined by national borders. So I just try to have a good mix of fresh and cooked items, grains and proteins. The more flavors the merrier. That said, these would be wonderful served alongside sushi or a Japanse noodle dish. Maybe with a fresh, gingery salad? You can even serve negimaki over rice, with some steamed veggies, as a main course. However you choose to serve, have fun with it! It’s a really playful and delicious grill recipe that is worth the extra effort. SWOOOOON. ~To simmer the seitan, you’ll need a pot that is at least 9 inches at the base. A 5 or 6 quart pot oughtta’ do it. If you’ve only got a 4-quart, then slice the seitan log in two before simmering. ~ Make the seitan a day in advance, so that it can cool in the gingery broth overnight. Or at least give it plenty of time to cool. ~ If you’re looking for a gluten-free variation, tofu might work, but if it’s not perfectly sliced, there’s a chance it will be too finicky about wrapping. Yuba or Soy Curls might be better options? ~ This recipe makes more seitan than you’ll need, but that’s ok! It may take a couple of tries before you get the strips perfectly thin for wrapping. And any left over seitan will be great in a stir-fry. ~ I made these on an indoor grill, but they’ll work outdoors, too! You might want to soak the toothpicks in water, so that they don’t burn too badly. Place all the ingredients for the simmering broth in the pot and bring to a boil. 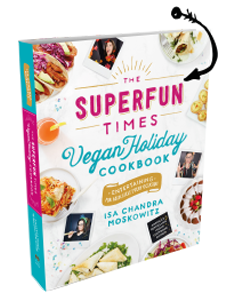 In the meantime, make the seitan. Combine wheat gluten and nutritional yeast in a mixing bowl. Add the water and soy sauce and knead until it forms a stiffish dough, two to three minutes. Form dough into a flat log that is roughly 8 inches long and 4 inches wide. When the broth is boiling, lower heat to a simmer and submerge the seitan. Simmer for 30 minutes, leaving the lid ajar so that steam can escape. Let cool completely in the broth. Once seitan is cool, start the marinade. Simply mix all ingredients together in a wide, shallow bowl. Now, slice the seitan. You want it to be about an 1/8 inch thick, but it doesn’t have to be perfectly even (you can see in the pic that mine wasn’t.) Just make sure that a the slice can wrap around your pinky nicely, without breaking or being unruly. Once you have 16 slices, place them in the marinade for an hour, flipping occasionally. In the marinade bowl, move all the seitan to the side, and add the sliced scallions, coating them in sauce. So your bowl should be one side seitan and one side scallion, more or less. Form the rolls on a dinner plate, to avoid messiness. Take a slice of marinated seitan and place it on a dinner plate. Place 4 or 5 scallions across, so that scallions will poke out of the ends an inch or so. 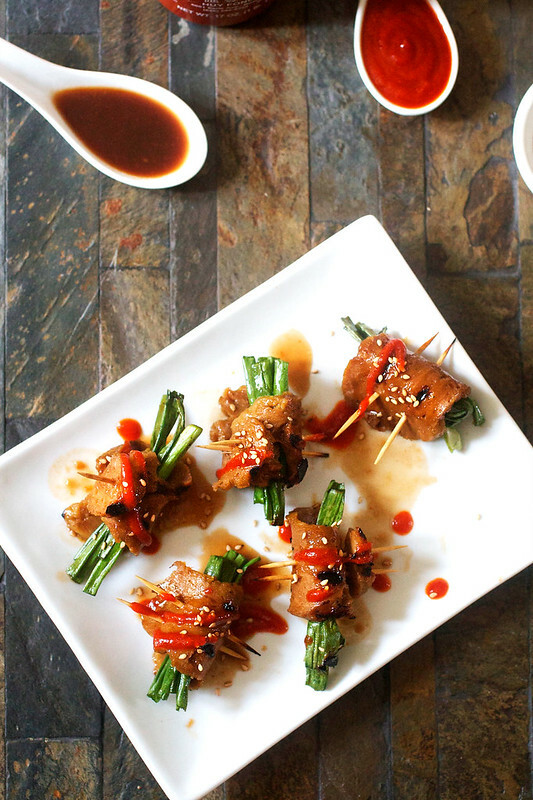 Now roll the seitan around the scallion, and secure it with a toothpick or two. Make sure that the toothpicks are going in the same direction, so that you’ll be able to grill them without toothpick interference. Once rolls are formed, heat the grill over medium heat. Spray or brush grill with oil, and cook rolls until grill marks appear. I did 8 at a time, and it took about 4 minutes on my indoor cast iron grill. Use a metal spatula to get under the rolls and flip them, spraying more oil as necessary. Cook on the other side until grill marks appear. Transfer rolls to a serving plate. When ready to serve, drizzle with leftover marinade, and some Sriracha (if you like it spicy, it’s ok to leave off) and sprinkle with toasted sesame seeds. Serve! I’m totally going to try these with bean curd sheets (thicker yuba)! Isa, I think you mean if you do not like it spicy, leave the Sriracha off. But anyways, these look and sound amazing! Thanks for all of your wonderful recipes! This is a much more basic seitan recipe than the one in Vegan with Vengeance. I tried that one and it is by far the best I’ve ever had, even better than the store bought kind; I made seitan picatta with. I am going to try this one since I have all of the ingredients already. Ooh Isa, these sound and look tasty! I’ll bet this would be delicious with strips of portabello mushrooms. I thought about that, but they might be too mushy. If you try it, let me know! Oh Isa. my Isa! Deez were soooooo good! Totally impressed my non- veg in laws. You are a truly talented gal who must be following your calling. So grateful! Oh you work fast. Thanks for the feedback! Looks so delis!! Nobody can’t stop me now from trying this, haha. I did swoon. Oh my fudgesicles this looks AMAZING!!!! I cannot find Mirin anywhere. Is there a good substitute for it? This. Looks. DELICIOUS!! I can’t wait to try it! I just wanted to suggest that you should remind people to use veggie hoisin sauce, as “regular” hoisin has oyster. I didn’t know this when I first became a vegetarian (and then I felt silly because hoisin means seafood in Cantonese)! This might be a dumb question, but I haven’t cooked with seitan very much and the only times I see it in grocery stores it is already precut into short strips or cubes. From the description it sounds like you made it from scratch? Do you have suggestions about where to find plain wheat gluten? Absolutely delicious and the sauce is great not too spicy, very savory disk. Any tips to get the seitan in thin strips?Some of mine were a little to thick to wrap. Awesome! Love your books, too. This is great with asparagus, too. Keep up the great work. This seitan was excellent! I didn’t make negimaki out of it; I simply followed the recipe for the seitan and after it cooled I sliced it and marinated it in a homemade teriyaki sauce and then baked it in the oven. It was very tasty! I haven’t had much luck making homemade seitan before, but this time it worked out great. And I couldn’t stop sticking my face into the pot to smell the broth with garlic and ginger… who knew such a simple broth would smell so darn good? Apparently I need to cook with ginger more often… Anyways, thanks, Isa! These look amazing. Will they work out okay if I heat them in a skillet instead of over a grill? I’m thinking it might be a good idea if I start reading recipes all the way through before I start cooking. Haha, yeah, reading the recipe is always good. Skimming, at least. I would try them in the broiler, but I’m sure they’ll be good sauteed, too! These were a huge hit. Realized halfway into it that we had no sriracha in the house, but subbed in some garlic chili paste instead – worked out just fine! I made these this past weekend for our Supper Club and they were a hit! I had trouble getting the rolls to stay together, because my seitan strips were too short, but they were still yummy. I had leftover seitan, so I made a sauteed batch for lunch yesterday and I enjoyed those even more than the grilled ones. So juicy! My husband also asked if I would make them again just for us for dinner – so these are definitely a keeper! Slice on a bias next time, if the seitan loaf doesn’t seem wide enough. Happy that you liked it anyway! Thank you for another amazing recipe. We had them last night and the recipe has been permanently bookmarked for future use. So, so good. I look forward to trying the seitan in stirfry. Yay, thanks for the feedback. Is it always an option to steam seitan instead of boiling it? I’ve made it once and I steamed it (I’m new to vegan cooking), and it was excellent. It depends on the recipe. For steaming seitan recipes, I always add more flavor to the seitan itself, where in simmering recipes, I add more flavor to the broth. I haven’t heard of seitan being so easy to make – woowee! I like to claim that you have the greatest recipes on earth, btw. OK, I need to buy an indoor cast iron grill just so I can make this. Anyone have suggestions on a brand? Bloody brilliant and absolutely delicious. I made it along with cold peanut sesame noodles. I’ve never made homemade seitan before and have only had seitan once before in some soup. I was worried because I’ve read so many stories of people messing it up and have had some pretty disturbing mock meats before but this was ridiculously good. I will make this again, just a larger portion. Love this recipe. It looks so tasty!! I have gone so far as to buy vital wheat gluten but never got around to making seitan. But, this recipe is inspiring me to try making my own. It looks so good! Thanks! When I give up, I accept life. No condition is attached. No desire is different. Your duties, I bear. But now I do not let it go, I take some fruit from some fruits. Can i use layers of rice paper instead of seitan?